Restful sleep is easily ruined by incessant itching that can envelope the body out of nowhere. Just because itchy skin is yet another symptom of menopause does not mean you have to put up with it. 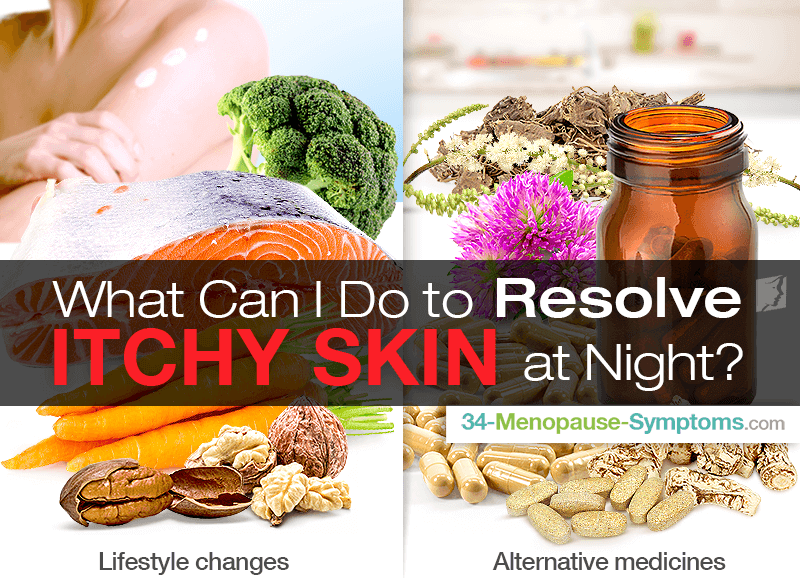 Continue reading to learn more about causes and solutions for itchy skin at night so you can finally get the beauty sleep you've been yearning for. For women passing through the menopausal transition, the most common cause of itchy skin at night is due to hormonal imbalance. Estrogen receptors have been found on cellular components of the skin. Accordingly, as estrogen levels fluctuate and drastically decline toward the end of reproductive years, there are changes in skin collagen. These changes in skin collagen cause decreased elasticity and water content, leading to itchy skin, even at night. Moreover, some other causes of itchy skin include dryness; allergic reactions; skin conditions and rashes, like psoriasis, eczema, parasites, dandruff, scabies, and lice; skin infections; nerve disorders; and chronic illnesses, such as kidney failure, liver disease, anemia, thyroid disorders, and cancer. Itchy skin from these causes is generally not centralized to only occurring at night. Finally, what could also aggravate itchy skin at night includes improper sleepwear and warmer temperatures, either from your thermostat being too high or from your body warming itself up, which can trigger night sweats and then itchiness from loss of water. Also, caffeine and alcohol consumption before bed can widen blood vessels, thus prompting itchy skin at night. What Can I Do to Resolve Itchy Skin at Night? To manage itchy skin at night, your doctor may recommend you try applying anti-itch creams or lotions as well as take antihistamines to help you sleep undisturbed. Nevertheless, treatment options depend upon the underlying cause. For menopausal women, the best line of defense to treat itchy skin at night begins with balancing hormones. Starting with simple lifestyle changes is the best way to go about nourishing the endocrine (hormonal) system for optimal function. Start by optimizing your diet with nutrients proven to promote skin health - such as omega-3 fatty acids and B vitamins - as well as maintaining beneficial habits of using fragrance-free moisturizers and wearing comfortable, loose cotton clothing at night. Furthermore, pair these adjustments with the use of alternatives medicines. Phytoestrogenic herbal supplements of black cohosh, dong quai, and red clover are just a few that fill the hormonal gap of estrogen in the body. In turn, hormone-regulating supplements, like Macafem, nourish the endocrine system to produce its own hormones, thus getting rid of itchy skin at night for good. To treat itchy skin at night caused by other conditions, speak with your trusted healthcare professional about appropriate medications and measures to take. To prevent any possible aggravation of the symptom, wear comfortable pajamas and try to keep your room at a cool temperature to avoid overheating and the occurrence of night sweats. Also, avoid alcohol or caffeine consumption before bedtime. In summary, itchy skin at night in menopausal women is caused by declining estrogen levels. However, other causes include allergic reactions; skin conditions and infections; and chronic illnesses. Although management options include the application of anti-itch creams and lotions as well as antihistamines, the most effective way to combat itchy skin at night is by treating the underlying cause, which in the case of menopausal women is hormonal imbalance. This can be done by enacting simple lifestyle adjustments as well as taking alternative medicine. Itchy Skin and Thyroid Problems: Are They Related? Discover the relationship between your thyroid and itchy skin here. Don’t let the health condition cause your discomfort for years to come. Wondering why your skin is constantly itching? Read more to find out three common causes for itchy skin bumps. Itchy skin can be very irritating and uncomfortable. There are several home tips for combating itchy skin. Keep reading to learn more.